We encourage the development of your spiritual gifts! If you have not already done so, please fill out the Time & Talent Survey found below. Starting in 2013, our church community has been committed to our Faith in Action days. 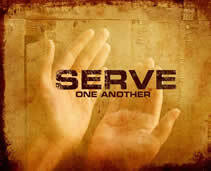 We typically assign 2 Sundays during the summer to be the hands and feet of Christ in our community at large. 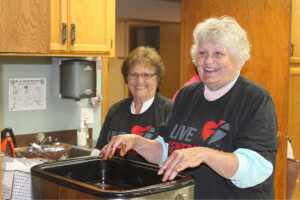 Historically, we have had approximately 100 servants sharing their gifts with up to 10 different area organizations that requested assistance each Faith in Action day. We end our service day with lunch back at the church. What a blessing! Do you know someone who would be open to a visit from a Calvary neighbor – maybe someone new in your neighborhood, someone who’s visited Calvary, a new co-worker, or someone searching for meaning and community? Contact the church office, and we’ll begin this good work of getting to know our neighbors. Calvary is blessed to share our building through the local Servants of Shelter program with neighbors experiencing homelessness! There are many volunteer opportunities, primarily as an on-site host for four hours at a time. Help with meals will also be appreciated! Background checks are expected for all volunteers. Please download our background check form here. Those who have completed this Calvary-specific form previously need not resubmit; ALL others are expected to fill out and return the form. This is not done out of distrust, but to conform with our congregation’s and SoS’s safety policies, which help to ensure a safe environment for our guests and volunteers. Also, SoS leadership has developed two other documents for volunteers: one on confidentiality and one on other expectations. Please read these documents as the content is vital. Volunteer training will be offered as we establish our hosting dates. New volunteers are expected to attend; returning volunteers are encouraged but not required to attend. Please familiarize yourself with guest guidelines; a Calvary-specific training packet (training packet is generally accurate, but some revisions may be made). Thank you for your generous donation of your time for this important ministry! Other - Please tell us if there are other gifts you would like to share!